Updated: We have more information about Z Stylus support for the ZenPad S 8.0. See below for details. Update 2: We have a second article, newer, which looks at the Z580CA vs. Z580C and the differences. With any deluge of information, there are bound to be issues. We’ve seen websites, even official websites, having details incorrect. 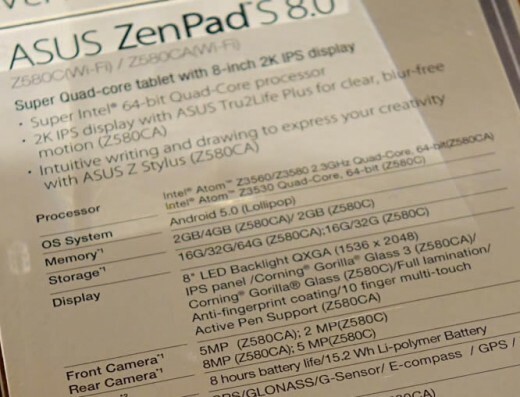 We believe there is some misinformation regarding the highly regarded ZenPad S 8.0 and the two models, the Z580CA and Z580C. So you want to know the difference between the Z580CA and Z580C. Here is the information you want, and it’s the information that has been made official. That isn’t to say there are typo’s or mistakes in the official specs, so if needed, we will update this posting as we move forward. Simply trust us on this one. OK? First, the Z580CA is the premium of the two. Not by much, but there are differences for sure. Pardon? Is that supposed to say “Active” and not “Actice”? It makes us question out loud what is going on with Z Stylus support. 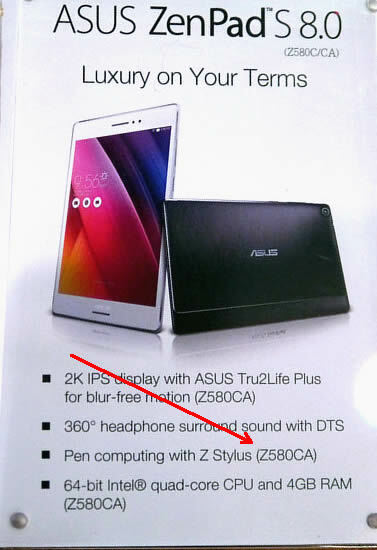 Further, the official product page on Asus.com for the Z580C does not show the Z Stylus, however the page for the Z580CA does show the Z Stylus. We are seeking clarification. Update: We are confident in saying now that Z Stylus support (pen computing) is exclusive to the Z580CA model and not the Z580C model. This is a BIG deal and I would suspect a lot of misinformation with other website (no offense to anyone). Please share this page with others. I originally bought the Z580C but promptly returned it. I absolutely loved the design but felt the UI was a little buggy in spots. I also wanted pen support which I later found that it did not support. After nearly two months, I’m finally about to get my hands on the Z580CA. I’m hoping the higher processor and additional ram will smooth the performance out. BUT, an ongoing frustration for me has been trying to buy the Z Pen. There is one dealer on Amazon selling it for twice the price but I just can’t seem to bring my self to do that. I’m going to wait but it got me thinking about alternatives. Are there any other styluses compatible with this tablet? There is very little information and I’d appreciate any insight from folks that have the tablet and experimented wth other styluses. Thanks! If you haven’t already bought the pen, get it directly from asus for 29.99 instead of amazon at 49.99. Sorry if this is a little belated, but I’m sure this info will be of help to others if you already have your stylus. I have been looking for a good 8″ tablet and I must say that the Asus Z580CA has won my heart. Thanks so much for the information provided. I’m off to order my own Asus Z580CA. I am about to order this model: ZenPad S Z580CA. I have a question regarding the hardware specs; this does not appear with clarity anywhere. Does this model have a SIM card slot (mobile telephony)? Hi. Sorry, the ZenPad S 8.0 does not have a SIM port and there aren’t any planned models (perhaps there will be an announcement about a future model) that supports SIM card. Thanks! Can anyone speak to how well the Z-Stylus works with the Z580CA for handwriting? I’d like to use it for taking notes in meetings. I like the way my Galaxy Note 5 handles this, but the larger screen on the tablet would make it a lot easier. are there other brands of stylus other than the Asus which are known to work with the Z580CA? Has everyone been pleased with their purchase(s) of the Z580CA? Trying to justify a budget tablet upgrade and was thinking about going with the lesser 2GB RAM/32GB Z580C model… knowing that they recently received 6.0 Marshmallow update i’m not sure i could find a comparable device in that price range. I don’t care that much about the lack of Stylus support, although that’d be a nice bonus. Hard to justify the extra 100$, but the increased CPU and RAM might come back to haunt me in a year. Appreciate any feedback or thoughts and experience you are able to share with your ASUS ZedPad. I just got a free Z580C as part of a study I’m participating in. Has the stylus situation changed since this tablet was released? Is there any stylus available for this model? Hi. No, sorry they don’t have the display/technology in that model that supports the Z Stylus. as per some info on youtube.. any non electromagnetic stylus device works on every smartphone or touchpad screen (just like our fingers do). have u checked “adonit jot pro fine point stylus?” its pressure sensitive and is great for sketching as well.